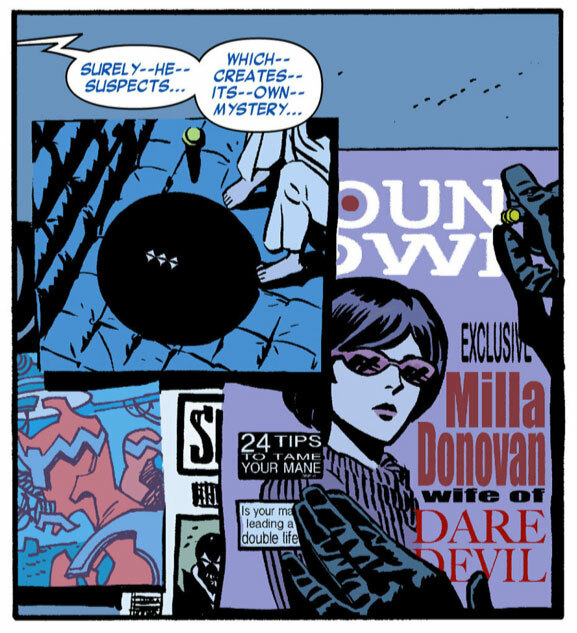 Yes, it’s time to, once again, revisit the most recent issue of Daredevil. Before we go on, I do want to point you to a couple of interesting links. The first is an unlettered preview of Daredevil #25, and the second is an interview with Mark Waid about the current goings-on in Daredevil, and what the future might hold. The interview features the same pages as in the unlettered preview, so you may want to cut straight to that. The interview will also have some input into the mystery villain discussion I’m saving for the end of this post! First off though, let’s talk about the art. 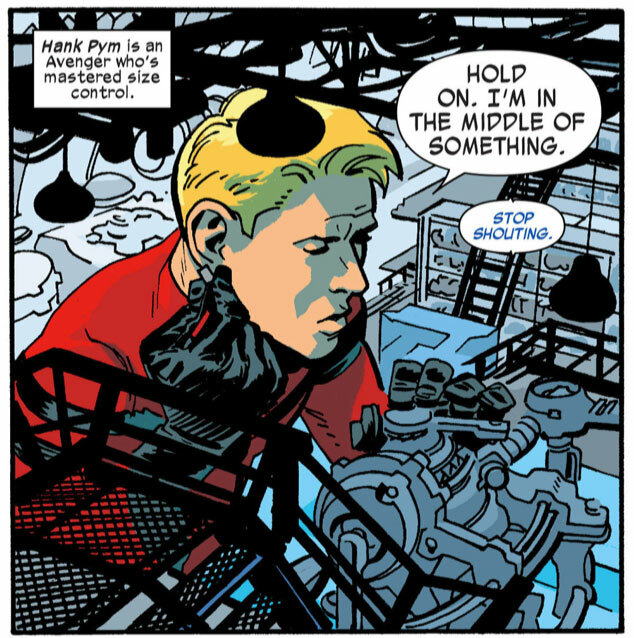 I love Chris Samnee’s expressive and straight-forward approach. Well in line with the lighter touch of this title, going back to the relaunch, Samnee never backs away from injecting humor into his storytelling. 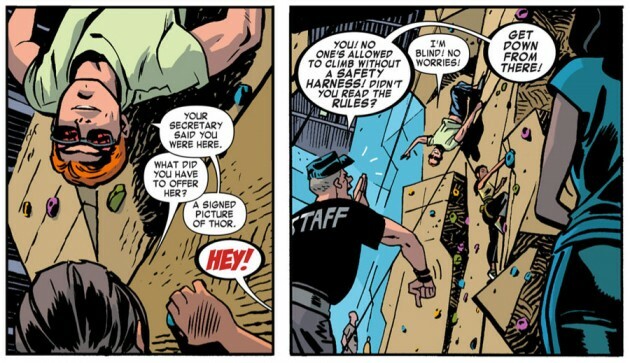 Here are some of my favorite scenes from Daredevil #24. When I talked about wanting to hug Foggy in the proper review of this issue, this is the panel I had in mind. It’s amazing that Samnee is able to capture both Foggy’s resilience and vulnerability in this panel. He also looks appropriately groggy. And very human. Aside from the obvious fact that Matt doesn’t seem to care one bit about his secret identity anymore, the way Samnee captures Matt mischievous side in this panel on the right is priceless. I have to wonder about one thing though: How do his glasses stay on? Glue? 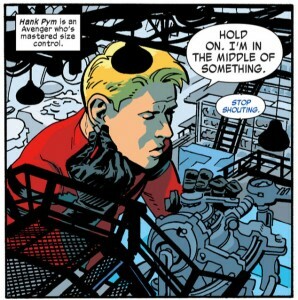 Seeing Hank Pym speak into a tiny cell phone is just too cute. Well, technically, the phone is the size it should be, it’s Hank who’s huge, but you know what I mean. The only thing that could match this for cuteness is seeing him shrink himself down to the size of a mouse a few panels later. Okay, seriously. How cute is this? Hank shrinks the wild dogs down to the size of mice and scoops them up. Maybe I’m being silly, but this puts a goofy grin on my face. It’s always been implied that Foggy is the one who actually runs the law firm and I’ve always imagined Matt to not really have the patience to learn what he needs to in order to accomplish these tasks without Foggy. This is a funny way of highlighting Matt’s ineptitude. So, who’s the mystery villain? Bullseye is dead. Granted, this is only a minor obstacle in comics, but bringing someone back from the dead can still be tricky business. It would also require that the events of Shadowland be addressed, and I’m not sure that’s something Mark Waid would want to poke around in. … is this really Bullseye’s style? In order to do this, he would have had to not only cheat death, but amass a great deal of money AND grow better people skills. The mystery villain is seen depending heavily on other players. While Bullseye is clearly intelligent, this all seems a little too big for him. So, what do you guys think? I’m leaning toward someone in the vein of Mister Fear or the Purple Man (even though the villain doesn’t appear to have purple skin). It would also be kind of cool if this was someone who wasn’t a traditional villain at the time he had his first run in with Daredevil. I’m definitely expecting the unexpected! Well, just saw the cover to issue 27, and if that’s a red herring, it’s a HUGE one! But as far as who the villain might be, I’m going to go totally out in left field and say it’s The Masked Marauder — who, by the way, was seemingly killed in issue 27 of Volume One. Coincidence?? We’ll find out! When is Foggy not huggable? Yeah, Bullseye is dead but he shows up in End of Days which is supposed to be canon, right? So he gets better. But I’m hoping it’s not him because as you said it’s too obvious. Those tiny, vicious dogs were cute when shrunken, yes. @Medda: This is one of the reasons I don’t view End of Days as in continuity. It seems more like they are just writing that in the “Bendisverse” if that makes sense. I assume that much of the story was laid out when it was first announced years ago (before Bullseye died) and what seemed liked it could be in continuity in 2008 or so just doesn’t really fit anymore. That’s how I see it anyway. @David: Death-Stalker is another good guess. The “Red Batman” line is hilarious and a sign of a confident book, perfectly comfortable with itself. @Gloria: Except that Mark Waid has said that Kingpin is one of those villains he never wants to see again. The Owl is a good guess though. He should be pissed at Matt for cutting him with a sword in Daredevil #500. But I think he may have recovered from that in some other book. It’s hard keeping track of all these villains! I’m now wholly convinced that the mystery villain is Death-Stalker and his female assistant is actually the second iteration of the character! Exhibit A: The condition the original Death-Stalker was left in after his last fight with Daredevil would explain the need for the casket. Exhibit B: The silhoutte of the female assistant perfectly matches the outline of Death Stalker II without her hat and cloak. Exhibit C: The original Death-Stalker got his powers via a TIME displacement ray and for those of you really paying attention you’ll notice that the scene with the mystery villain in this issue takes place inside a CLOCK tower. Hm, there’s one problem with this theory though. Death-Stalker II appears for the first time in Villains for Hire #1 which came out after the first two arcs of Daredevil vol 3. So, the mystery figure appearing before Klaw (presumably the same mystery woman we see here) predates new Death-Stalker by several months. It may, of course, have been the case that her identity wasn’t clear to Waid either at the time he wrote her in, or he may have known about the plans for a female Death-Stalker. Either way, it’s a complication worth considering. Hmm… that is a complication. But how’s this for Exhibit D: The original Death-Stalker “died” in issue #158 of Daredevil Vol.1.He seemingly met his demise fighting Daredevil in a graveyard by teleporting then re-materialising inside a tombstone. Do you know which kind of tombstone he materialised in? It was a celtic cross tombstone. Go have a look at panel 2 of page 2 (not including the recap page). The three points on the outside of the circle with the casket in the centre… It looks like a celtic cross to me! @Dan: Actually, the more I think about it, the more I’m sure you’re right. It’s the woman who’s the problem (although she may have initially been imagined as someone else and then later folded into the story as Death-Stalker II). I also think that some of the other players that Death-Stalker (presumably) is working with might be notable players in their own right and that this is a team effort that goes beyond these two. It’s obvious from the scale of the operation, of course, and in Daredevil #3 Klaw talked about there being “others” (plural) who had helped him. If Bullseye returns, as it appears he will, I would assume that someone with some clout in the Marvel U is pulling the strings. Bullseye wouldn’t orchestrate something this grand, nor would he work for some chump. I hope it’s the Kingpin. Dan, you make a lot of sense! Great points about Death-Stalker. He’s been my fav DD villain so if this indeed a comeback of sorts for the character(s) then Waid is all the more brilliant in my humble opinion. My other guess would be Owl, given his physical condition the last I saw of him and his resources to be able to carry out all these experiments. Christine, you picked out some great moments from this issue. I also liked Matt’s quip to Karen’s date, something along the lines of ‘I thought he was part of the wall’. Looks a bit like the Organizer. He did say he was going to break and ruin Foggy too. Or maybe it’s Mapone. There is one other villain from the distant past who bears a grudge against Foggy and wears a mask similar to that seen on the cover of #27. Crime-Wave (arrested in DD Vol. #1 #60), who turned out to be Foggy’s Assistant. The Organizer (Abner Jonas, a man of great wealth and a one-time mayoral candidate) also has a vendetta against Foggy. Incidentally, when, if ever, will the “revenge” plots finally come to a close? In recent years, Matt has been victimized by Vanessa Fisk, Mr. Fear, and now Waid’s enigmatic villain. Daredevil doesn’t really fight crime any more – he simply wards off “revenge” plots. Enough, already! Let the man practice law and fight crime!